Best of the bes!!! ;) just amazing!!! Everything just wonderful!!!! Really great and big apartment in a great location, near the beach, bus station and supermarket. The apartment is well equipped and you’ll find there everything you need. The host is super friendly and helpful, and really made our stay to be fun and pleasant. Parking, quiet neighbourhood. Great for one night family weekend stay. Nice hosts. Nice apartment, in good location. The kitchen was well equippred and the living room was comfortable, with a balcony at the front. The apartment was close to the beach and restaurants. Very easy to catch bus into old town. Laura, the owner of the apartment was friendly, and accommodating, even though she was unwell. The location and the view were wonderful. The host met us at the street and helped us with parking and advised us as to the best route to take to get to the old town and even how best to travel to our next destination upon leaving. 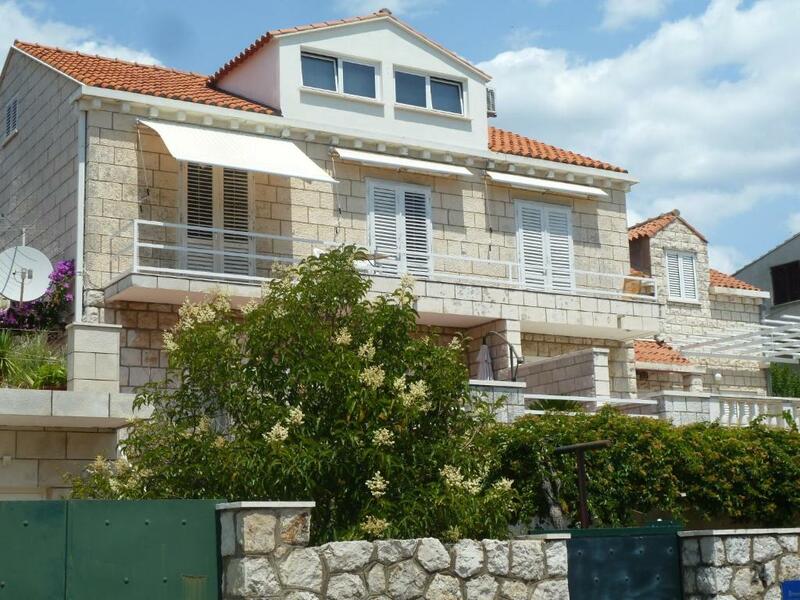 Amazing location: 5 min to the beach and the promenade of the Lapad district, 5 min to the bus station to the Old City of Dubrovnik, 5 min to the supermarket. Lara is a great hostess, so friendly and helpful! Clean and cosy apartment, everything is ready for cooking, even salt, sugar and pepper! Wifi is very good also. Very comfortable and very, very clean apartment with big terrace. Very helpful and nice host. Location is excellent for Lapad, but one has to be aware he or she will need some kind of transportation to old town Dubrovnik. The apartment was clean and airy with everything you could want. The hostess Lara was always around if we needed anything and always smiling! Restaurants, bars and the pebbly beach were a short walk away so very good location. Lock in a great price for Villa Timy – rated 9.4 by recent guests! Villa Timy This rating is a reflection of how the property compares to the industry standard when it comes to price, facilities and services available. It's based on a self-evaluation by the property. Use this rating to help choose your stay! One of our top picks in Dubrovnik.Set in Lapad, Villa Timy is only 350 feet away from a beach. Dubrovnik’s Old Town is 1.2 mi away. The property offers modern apartments with furnished terraces. Free Wi-Fi is available. All apartments come with air conditioning, an LCD satellite TV and a DVD player. A fully equipped kitchenette comes with microwave and oven. Free private parking is available upon request. A walk along the seashore promenade offers beautiful views of the Elaphiti Islands. Guests can enjoy sunbathing on Lokrum Island, riding in the Cable Car or walking the historic walls. Restaurants, bars and cafés are 150 feet from the Timy. A bus stop is 650 feet away. Villa Timy offers a pick-up service from Dubrovnik Airport against surcharge. When would you like to stay at Villa Timy? Our villa is located in a perfect location close to the beach . A car is not necessary . Everything is close to the Villa . Lapad is the best part of Dubrovnik with a lot of parks , beaches and various facilities ..
During your stay I 'm at your disposal for further information and services . Lapad is the elite part of Dubrovnik that offers everything you need for a perfect holiday . Located next to the Old Town , good restaurants and cafes , beautiful beaches , promenade . Area Info – This neighborhood is a great choice for travelers interested in beaches, the oceanside and sunshine – Check location Excellent location – show map Guests loved walking around the neighborhood! House Rules Villa Timy takes special requests – add in the next step! Please inform Villa Timy of your expected arrival time in advance. You can use the Special Requests box when booking, or contact the property directly using the contact details in your confirmation. The only thing that could have been better was to have a mirror in each bedroom, possibly on inside of wardrobe door. Lara was the perfect host who welcomed us on arrival and explained how to get to the supermarket, restaurants, bus and bank - all just a short walk away. The apartment was clean, comfortable and convenient and we had a fabulous time. The AC is in the living room, so it takes some time to cool the bedroom, but it was good enough for us. Air conditioning could have been better, but the owner did acknowledge there was possibly a fault and she had heard it making unusual noises and called to check as she lives next to the apartment. Welcoming owner, with good local advice on places to eat. Property great. Dubrovnik over busy in August! Pretty, ultra clean, comfortable, relaxing base to explore lovely coast. To read, walk, eat out, watch sunset while drinking cocktails and discover Dubrovnik. Brilliant fully equipped apartment with nice view. Easy walk to great restaurants and 5 min more to swimming areas. Parking is the same distance away, but you can unload your luggage at the apartment. Bus to the Old Town is 5 min walk and arrives about every 10 min. Hostess was amazing, so friendly and helpful. Everything was perfect, I appreciated that the host gave me a parking space (what in Dubrovnik is a problem), the apartment was very clean, I recommend to the future guests. And I think, w'ill come back to the same guest. The accommodation is very clean and very and large enough for two persons to stay. It takes about 5 minutes from the accommodation to the nearest beach of Adriatic sea. And, the owner, Lara is very kind and friendly.